Mental Health in all its complexities is a topic that impacts just about everyone… and yet is rarely talked about. Ableism, rooted in an assumed mental wellness, is prevalent even among communities that fight against other oppressive social norms such as hetero-patriarchy and institutionalized racism. For those of us experiencing depression, psychosis or any other form of madness, our struggles usually remain invisible and unacknowledged until they boil over into full blown crisis. When this happens the massive coercive potential of the state is used to force us back into line. 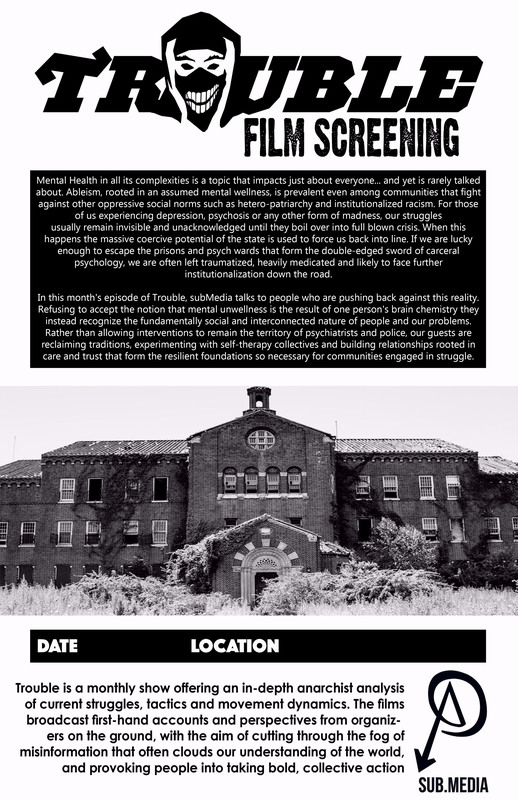 If we are lucky enough to escape the prisons and psych wards that form the double-edged sword of carceral psychology, we are often left traumatized, heavily medicated and likely to face further institutionalization down the road. In this month’s episode of Trouble, subMedia talks to people who are pushing back against this reality. Refusing to accept the notion that mental unwellness is the result of one person’s brain chemistry they instead recognize the fundamentally social and interconnected nature of people and our problems. Rather than allowing interventions to remain the territory of psychiatrists and police, our guests are reclaiming traditions, experimenting with self-therapy collectives and building relationships rooted in care and trust that form the resilient foundations so necessary for communities engaged in struggle. Trouble #17: Mad Worlds from sub.Media on Vimeo.